Researchers repair the cerebral cortex using engineered cells in a world’s first. A team from the University of Poitiers and the Institute of Interdisciplinary Research in Human and Molecular Biology (IRIBHM), has just taken an important step in the area of cell therapy, repairing the cerebral cortex of the adult mouse using a graft of cortical neurons derived from embryonic stem cells. The opensource study is published in Neuron. The team state that the cerebral cortex is one of the most complex structures in the brain. It is composed of about a hundred types of neurons organised into 6 layers and numerous distinct neuroanatomical and functional areas. Brain injuries, whether caused by trauma or neurodegeneration, lead to cell death accompanied by considerable functional impairment. In order to overcome the limited ability of the neurons of the adult nervous system to regenerate spontaneously, cell replacement strategies employing embryonic tissue transplantation show attractive potential. The researchers explain that a major challenge in repairing the brain is obtaining cortical neurons from the appropriate layer and area in order to restore the damaged cortical pathways in a specific manner. The results obtained in the current study show for the first time, using mice, that pluripotent stem cells differentiated into cortical neurons make it possible to reestablish damaged adult cortical circuits, both neuroanatomically and functionally. According to the team these results also suggest that damaged circuits can be restored only by using neurons of the same type as the damaged area. The team state that this study constitutes an important step in the development of cell therapy as applied to the cerebral cortex. This approach is still at the experimental stage and much research will be needed before there is any clinical application in humans. Nonetheless the success of this cell engineering experiments, which make it possible to produce nerve cells in a controlled and unlimited manner, and to transplant them, is a world first. These studies are expected to open up new approaches for repairing the damaged brain, particularly following stroke or brain trauma. Synaptic Contacts between the Transplant and the Host Assessed by Electron Microscopy 3–4 Months after Transplantation. 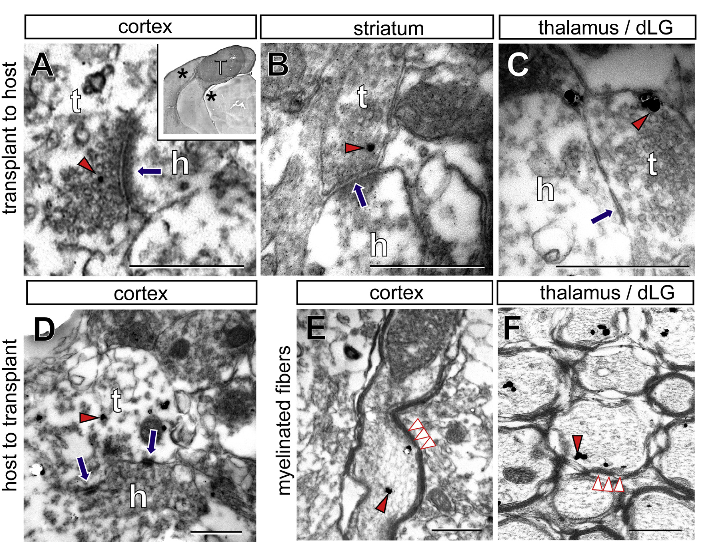 (A–F) Transplant (t)-to-host (h) contacts in the (A) cortex, (B) striatum, and (C) dLG and (D) host-to-transplant contacts in the cortex. Myelin sheets surrounding the GFP+ fibers were observed in the (E) cortex and (F)dLG. Red arrowheads indicate immunogold labeling for GFP, blue arrows indicate synapses (the arrows being on the post-synaptic side), and white arrowheads indicate myelin sheets. Inset in (A) shows the location of the electron microscopy pictures (indicated by asterisks) in relation to the transplant. Scale bars, 100 nm in (A)–(C) and 500 nm in (D)–(F). Area-Specific Reestablishment of Damaged Circuits in the Adult Cerebral Cortex by Cortical Neurons Derived from Mouse Embryonic Stem Cells. Vanderhaeghen et al 2015.